Streetcar under testing in downtown Kansas City. Streetcar systems can readily be upgraded into full-performance light rail transit. Photo: Michael Leatherman. 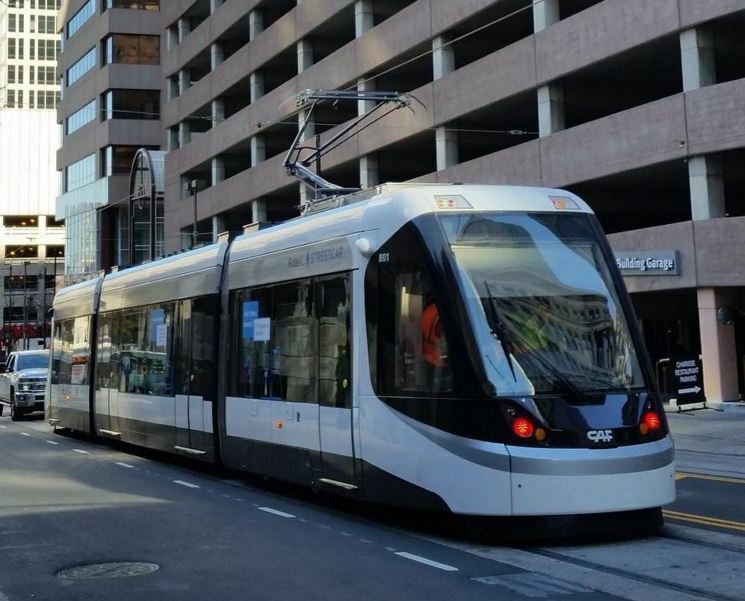 For the first time since the advent of the USA’s modern light rail transit (LRT) revolution in the mid-1970s, the modern streetcar — a scaled-down version of higher-performance LRT — has emerged as the leading form of LRT development for launching urban rail in American cities. Characterized by typically shorter stop spacing, somewhat slower speeds, more reliance on sharing road space with motor vehicle traffic, and often slightly smaller rolling stock, streetcars seem to be perceived as a more financially accessible path to initiate a new local urban rail system scaled to the needs of communities previously dependent only on buses for their public transit. However, because its technology is nearly identical to high-performance LRT, streetcar starter lines may offer the basis of a system that can be upgraded to “full” LRT via affordable and reasonable modifications. Modern streetcar projects in planning and preparatory stages of development are also under way in Oklahoma City, Milwaukee, and Ft. Lauderdale, leading the inauguration of urban rail for those communities as well. In most cases, streetcars are being introduced initially as circulator modes, typically for the CBD or a single major corridor. Even when routed in mixed (shared) traffic, streetcars offer faster, more attractive service to comparable bus operations together with additional benefits for urban livability and economic development. Henry and other public transport professionals and advocates emphasize that it’s critical to upgrade streetcar operations by converting shared-traffic street alignments into dedicated lanes free of other traffic, implementing traffic signal prioritization for streetcars, and expanding these new lines into other city sectors and suburbs.